Nentatsu ho and Seiheki Chiryo ho are names given to treatment techniques that have come not from original Japanese Reiki but from later Japanese Reiki, as practised by the Imperial Officers and passed on in the Usui Reiki Ryoho Gakkai (Usui Memorial Society). The two techniques are variations on a theme and involve using Reiki as a ‘carrier’ to convey affirmations or thoughts into you, or a client, to ‘treat’ bad habits and addictions or to modify thought patterns and limiting beliefs. Seiheki Chiryo means ‘habit treatment technique’ and Nentatsu Ho means ‘send a thought technique’. So there is an established tradition of using Reiki to enhance the effect of affirmations or to boost the power of suggestions to alter people’s habits or to introduce or alter emotions or enhance habits, thoughts, responses or behaviour. And that’s interesting because in the West has developed completely separately the use of spoken suggestions to help alter people’s behaviour, emotions, responses, beliefs and motivation. I am thinking of hypnotherapy and the use of Ericksonian suggestion patterns which are such a powerful way to help people to change things for the better. Now, you may know that I trained as a Cognitive Hypnotherapist with the Quest Institute at Regent’s University and I have used my knowledge and experience of creating hypnotic suggestion patterns to create a series of Nentatsu Ho Meditations that combine the gentle power of Reiki with the potency of Ericksonian hypnosis. So I have for you here a collection of unique Nentatsu Ho Guided Meditations, which I have tested extensively on a large group of Reiki volunteers they work fantastically well. So I have two collections of meditations of you: to embody important qualities that will help with your Reiki, and a collection that deals with building your self-confidence, losing weight and ditching anxiety. These Nentatsu Ho Guided Meditations help you to embody important qualities and resources to assist you on your journey with Reiki. What would it be like for you if you could become more intuitive? How would it help your confidence to become more sensitive to the energy? How would you life improve if you could really, deeply embody the precepts? What would it be like to have a solid and unshakeable Reiki routine? How would it feel to have the confidence to find your own path? These are the areas that my special Nentatsu Ho Guided Meditations concentrate on, created by blending the power of Reiki meditation with specially-created gentle suggestion patterns that allow you to deepen your experience of the principles and qualities that will help you to get the very best out of your Reiki. These meditations have been working incredibly well, and in fact they surpassed our expectations. It seems that when gentle suggestion patterns are combined with Reiki meditations, a very powerful combination is created, helping the listener to move powerfully in a new better direction. 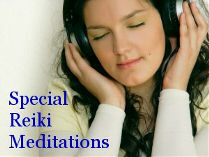 Each collection below consists of three Reiki meditation tracks and to get the greatest benefit from these Special Reiki meditation MP3s I recommend that you listen to one track most days for 4-6 weeks, during which time the beneficial changes develop and solidify. These Nentatsu Ho Guided Meditations focus on the three main challenges that a lot of people face in their lives: self-confidence, anxiety and weight loss. I tested the meditations on a group of people, all of whom used standard tests to give themselves scores for anxiety, depression and general wellness, so we could see what effect listening to the tracks for 28 days had on them. The results were impressive, so for example Nigel found that his anxiety and depression scores were cut in half, Sandra found that her anxiety reduced by 2/3rds and she lost 15 lbs, while Karen said that her confidence levels went from 5/10 to 9/10. Now of course everyone is different, and people react to such things differently, but I would be very surprised if you didn’t notice a positive effect from listening to a track for 28 days. A perfectly-crafted 19-minute guided meditation using the power of Reiki, and gentle suggestions, to help you leave behind anxious thoughts and worries. Reiki-boosted gentle suggestions will just wash over you and can change long-term the way you relate to food, allowing the weight to just ease off of you. The transforming power of Reiki, used with carefully placed suggestions, can help you to leave behind insecurities and feel so much better about yourself.